Can drownings be eliminated on the Great Lakes? This story is the fourth and final part of a series on dangerous Great Lakes currents and their impact on human lives in the region. With dangerous currents a fact of life along the Great Lakes, officials are looking for ways to limit the number of drownings. On a recent sunny afternoon on Lake Michigan, people are enjoying the cool waters of Warren Dunes State Park … despite a large red flag flying above the crowd. 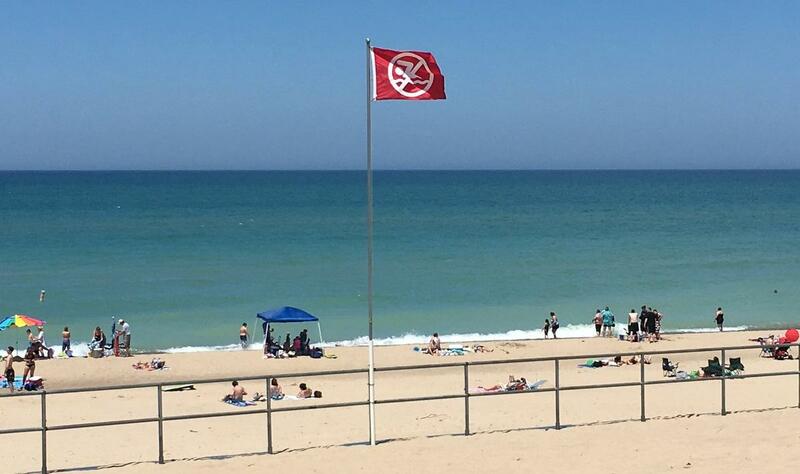 The flag means no swimming due to dangerous currents. The park has no lifeguards, so there’s no one to enforce the ban, and some beachgoers still plan to go into the lake. Warning flag at Warren Dunes State Park. Image: Elizabeth Miller. None of the Great Lakes is well represented in terms of having lifeguards trained for rescues in dangerous currents. The United States Lifesaving Association , which certifies open water lifeguard agencies around the country, only has 33 Great Lakes chapters. The association’s Tom Gill says that’s not enough. “Any beach that is publicized as a tourist destination, where they’re collecting revenue from people that are coming there — we feel there’s a responsibility to protect the people that are going to those beaches,” Gill says. The Great Lakes Surf Rescue Project tries to increase the safety of beachgoers by holding water safety trainings for people of all ages — even 3 and 4 year olds. Coast Guard units also play a role in education says Lazaro Lopez, Executive Petty Officer for Coast Guard Station St. Joseph, Mich.
Then there’s the effort to get surfers, kayakers, and non-swimmers to pay attention to what’s going on around them. The Surf Rescue Project says everyday objects that float — things like footballs and plastic coolers — can be used to help people struggling against a dangerous current. Warnings signs at Warren Dunes. Image: Elizabeth Miller. 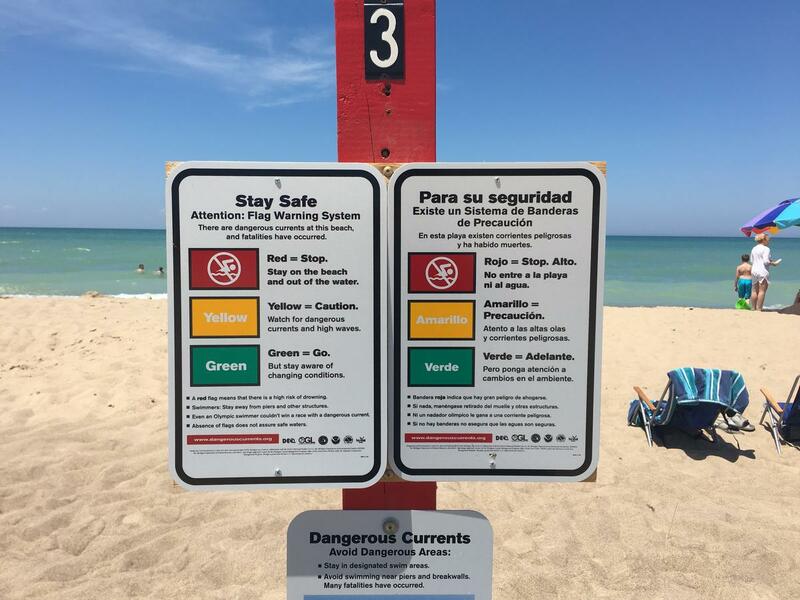 Some beaches have signs explaining what a dangerous current is and flags to prohibit lake use in hazardous conditions. But it’s difficult to know what prevention tactics are working — and who’s even listening. Pratt says the beachgoers who pay attention to those signs are the ones who probably understand the dangers already. It’s like preaching to the choir, he says. According to the Great Lakes Dangerous Current Incident database, there’s an obvious target audience. Drowning victims are 80 percent male. And half of the drownings happened near a structure, like a pier. Despite the safety measures, Pratt says the number of drownings in the Great Lakes is up compared to last year. And 2016 bears a similarity, weather wise, to 2012, when the Surf Rescue Project tallied 101 deaths — many of them due to dangerous currents. For more information on the Great Lakes Surf Rescue Project, visit their website. This story was originally published by Great Lakes Today and is republished here with permission. Great Lakes Today is a collaboration of WBFO Buffalo, ideastream Cleveland, and WXXI Rochester.